Preheat oven to 375 degrees. Slice the tops off each squash and scoop out the "meat"; coarsely chop the "meat" and sauté in a small amount of olive oil; set aside. Sauté coarsely chopped red onion, garlic, tomato and pine nuts in olive oil. Add to the sautéed zucchini and chill in fridge for at least 20 minutes. Make small grain couscous according to package instructions with vegetable bouillon and Herbes de Provence for seasoning. Put this in a bowl with a small amount of Asiago cheese. 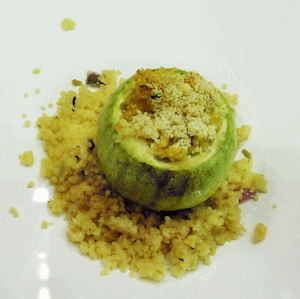 Make double this amount if you want extra couscous for plating, as in the photo. Season the round zucchinis with a little salt & pepper inside and brush with olive oil outside. Fill each squash and top with cheese. Bake 25-30 minutes for smaller rounds, adjust for larger rounds, until a toothpick or knife inserted through the outer skin tells you that the squash is tender.